The deck wants establish an early lead using cards like Golem Metallurgist or Celebrant with Dreamshaper's opening gambit and Scion's First Wish in order to cycle through it's cards fast. It has cards like Portal Guardian to allow for a smooth transition to the midgame where powerful tools like Blood of Air and Sandswirl Reader can solidify your small minions on board along side with Inner Oasis to make them resilient. The list aims to use the golem package to cycle as quickly as possible with the help of Dreamshaper and Scion’s First Wish establishing a swarm style like board state which is hard to remove. 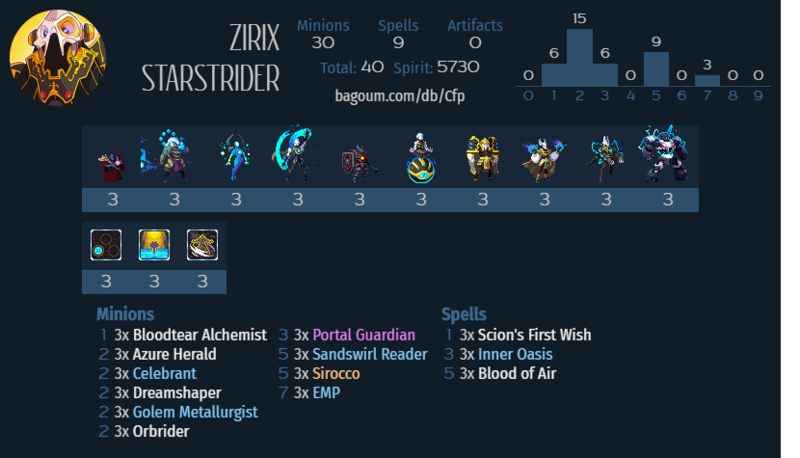 Cards like Inner Oasis and Portal Guardian greatly benefit from such board states. They help push the mid game allowing you to establish some board control only vulnerable to cards like Plasma Storm and in some cases Light Bender or Thunderhorn. Once you reach the midgame, hopefully with 15 life or above the removal tools of vetruvian come into play. Here you’ll utilize Blood of Air to remove big threats and usually 2 for 1. Or establish sand tiles with sandswirl reader while pushing tempo on the board. Sirocco will then allow you to re-establish lost board states if you’ve played 4 or more golems. It also has great synergy with portal guardian and inner oasis. The deck uses Azure Heralds to stave off burn style aggression along side with orb rider to re-bounce the azure heralds for more life. Orb Riders can also be used to bounce back Dreamshapers for more card draw or Sandswirl Readers to be able to bounce enemy threats and create more sand tiles. It also has good synergy with Sirocco. Replaying the card will give you more golems on board and a hard to deal with board states. Cards like Bloodtear Alchemist is used in here to tick off artifacts or kill off eggs and heart seekers and other minions that otherwise would have lived at 1 hp. It can also be used to push your damage when you need it and can be bounced back to hand with Orb Rider for more pings. EMP is an late mid game drop that allows you to stabilize board states and remove buffs and artifacts. It will sometimes transition you into late game where bouncing back multiple siroccos will be the key to winning.